Spacious end unit town house - most desirable location at the Mount Mansfield Town Houses - closest to slopes - True ski-in ski-out! Views of the Worcester Mountains from the 15-ft ceiling living room. Ski to the base of the Easy Mile Chair from home. Ski home for lunch and at the end of the day! Includes well-appointed kitchen, six-seat alpine style dining room table, entertainment center with cable television, DVD, CD player with CDs, FM radio. WIFI Internet access. Unit includes a very nice carport. Right On The Slopes: Cosy and comfortable Mansfield living with rustic accents - Ski in and Ski Out! Decor right in rhythm with the new Hotel at Spruce Peak. Updated with creature comforts - cool entertainment center with flat panel TV and enormous music selection on Windows Media Player system. Separate heating zones in each of the bedrooms, basement bedroom, and living room / dining room area. TV's all around. Separate boot room with heater and bench. Reliable WIFI with newly installed router. Car Port to keep the snow off your vehicle while you're not driving. Fully appointed kitchen. Overabundance of linens and towels, and a washer - dryer in the basement. Large closets in the bedrooms. New dresser in basement, which also includes a nice sink and vanity. Free HBO. Great Dining In Either Direction: Head North on the Mountain Road for true 4-Star dining at the new Inn at Spruce Peak. Head down the hill for the widest dining selection of any ski town in the East. Off the Beaten Path: Unit is nestled in the trees on the southeastern face of Mansfield with direct access to the Easy Mile Chair. Take your skis off for lunch or at the end of the day within 50 feet of your front door! PARKING - no worries with our carport and parking space! My father was the 2nd owner in this development, purchased in 1971. It has been in the family ever since. Dad was in the 10th Mountain Division during WWII, and you can bet his kids are skiers! As a ski patrol alumnus, I can really appreciate being able to easily and conveniently get into the warmth at lunchtime, or at the end of the day. Quiet, but within easy driving distance or shuttle trolley of all of the excitement Spruce Village and Stowe Village have to offer...get off the beaten path and enjoy some privacy. Top line of alpine townhouses in this development offers unprecedented ease of access to skiing without having to move your car! Summertime pool as part of the association. Car port - caution! No Roof Box! Rent kayaks and canoes at Waterbury Reservoir, a 20 minute drive from the property. The best terrain in the Northeast! Stowe has a great public golf course 10 minute drive from the property. 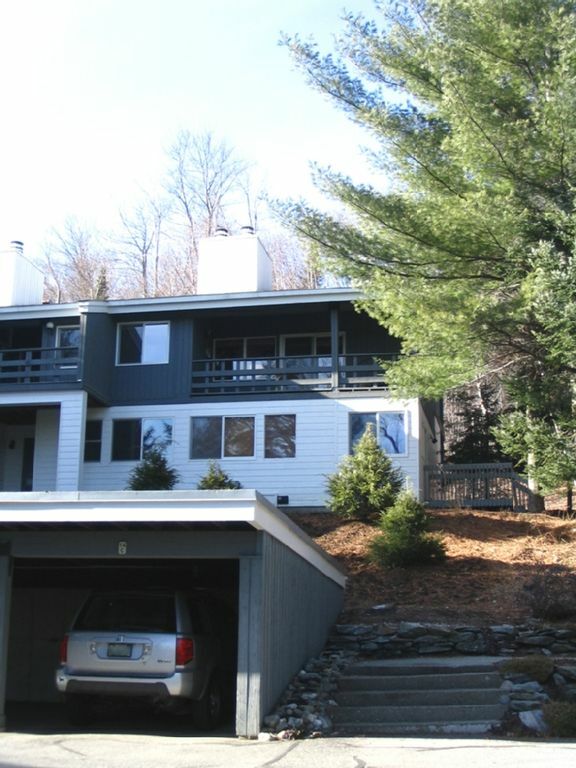 In season, great, heated pool nestled in the Green Mountain National Forest! All the makings of a truly great romantic getaway or warm, relaxing family getaway. We love staying at this Townhouse at Stowe-plenty of room for our family- fully stocked with everything we could possibly need and the perfect location for our ski vacation- Right out the back door to the trail to the lift - couldn’t be better! Steve and Donna are wonderful hosts- this was our third time staying at their Townhouse and we hope to return next year. You are WAY too kind! Thank you so much for your review. After ski season is over this spring we will begin some more upgrades...stay tuned! This is a great condo and it is truly just a few footsteps to ski in / out. Also, the condo was clean and the heating system worked well. We will keep this in mind for future visits to Stowe. Very comfortable and great location. Accommodations were very comfortable and location was terrific, with immediate access to the mountain. Steve was a fine host and made the rental experience simple. We enjoyed our stay. Thank you for your very generous response Sharon! We are delighted that you had such a great experience. And, thank you for staying with us! Matt S.Where do you live? This place was just what we needed. Close to the slopes, space for everyone, and the fireplace was a real treat. The kitchen had everything we needed. I'll definitely book this place again when my family returns to Stowe. Thank you for your response Matt! We are delighted your experience was enjoyable! Working with Steve was a breeze. His condo was a large corner unit, just up the trail from the Toll Road ski lift (although weather closed the lift while we were there). Access and exit from unit were easy, thanks to Steve (who sent us a care package and keys in advance). Unit had everything we needed. Thanks, Steve. Thank you Harry! We appreciate your business and we are happy that your stay was an enjoyable one! Come back anytime! The perfect place to stay on the mountain! Ideal location slope side truly ski in ski out conditions permitting. This is our second time staying at Steve’s town house and it’s perfect- plenty of room, well supplied and The best location ! The owners are a pleasure to deal with- we hope to be back again next year! Thank you again Linda for staying with us! So glad you had an enjoyable time! Please come back anytime! Find peace of mind in this world-class destination resort area. You have immediate access to the finest that Stowe has to offer, from this very quiet end unit Town Home. Lower rates in the pre-season and post-season. Call us and talk! We're reasonable, real people who's religion is SKIING! Coming to Stowe during Summer, Fall, or Mud Season? In town on business? Give us a call...we'll work with you to find a rate that fits your budget. WIFI included FREE!